Anticlastic forming in sheet metal is a fairly recent development in the area of gold- and silversmithing, having been developed by the silversmith Heikki Seppä and the goldsmith Michael Good since the Seventies. This late development is surprising considering that anticlastic forming is the complementary action to raising, the fundamental technique of plastic sheet metal forming: While raising stretches the central part of a piece of sheet metal and compresses the edges, resulting in cup shapes, anticlastic forming compresses the central part and stretches the edges, resulting in forms most often described as saddle-shaped. The process has to my knowledge only been applied towards aesthetic ends and not been exploited commercially for functional applications, besides a minor role in the forming of spout or handle for a teapot or jug. The main aim of this research has been to arrive at a proper understanding and documentation of the transformation of shape taking place in the deformation of flat templates into three-dimensional forms. A lot can be done with the basic anticlastic 'channel' (below left, generally formed to a stronger degree). Michael Good has developed a great variety of forms based on this process. 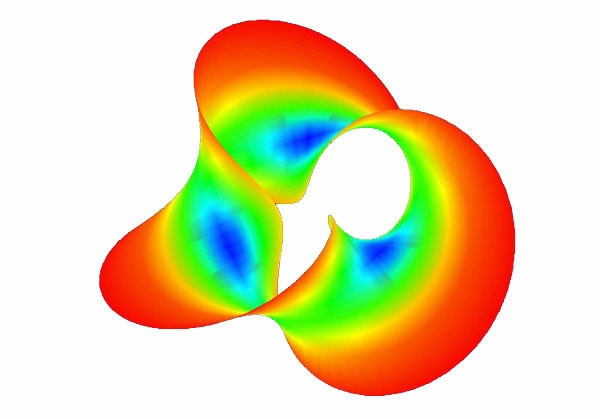 One interesting transformation is the helicoid, which can be created by 'shifting the orientation of curvature'. 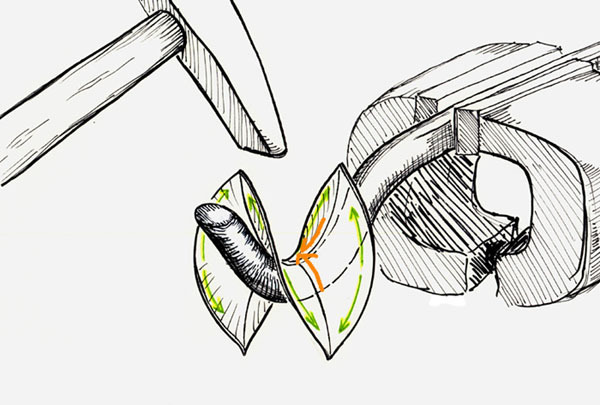 In the channel the principal curvatures follow the longitudinal 'axis' of the strip and the perpendicular curved cross-section. 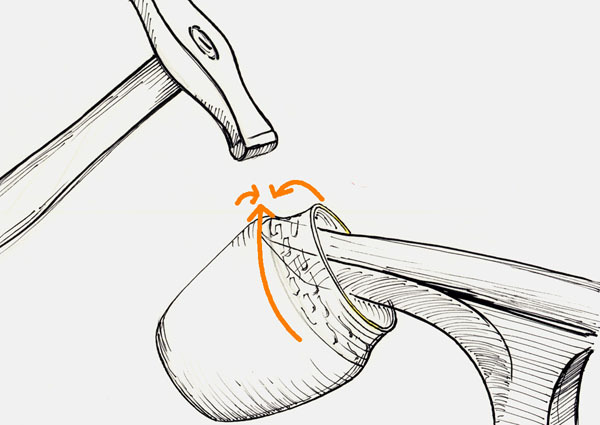 In the helicoid the curvatures are oriented at 45 degrees to the long, straight axis and its straight cross-section. 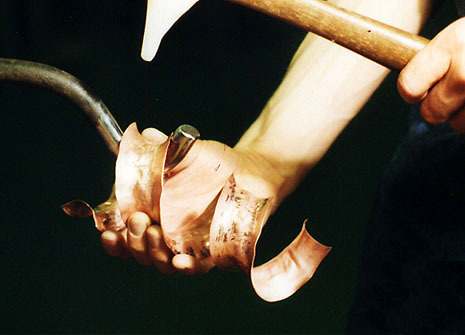 The Irish silversmith/metalsmith Brian Clarke Michael Good have also undertaken some research on the creation of ancient Celtic anticlastic torques, which show a high level of technical expertise. So in this respect anticlastic forming techniques have been around for a long time. The forms I wanted to create varied in their ratio, orientation and degree of curvature in different sections of the forms and occasionally included synclastic (domed) sections This required a careful planning of both the forming process and the templates. 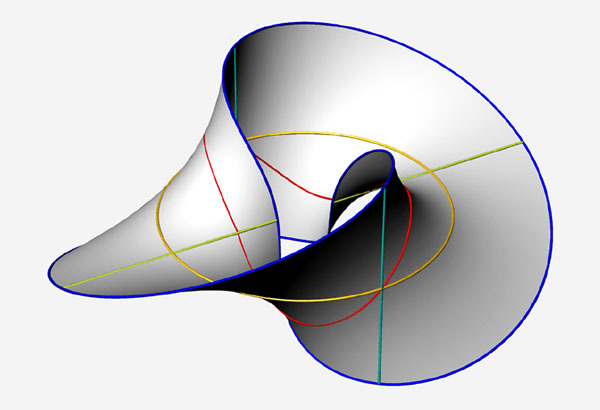 A basic case is the Möbius band which can be simplified as a rectangular strip going through a 180 degree twist while closing back in on itself to form a circle. This not only involves a change of orientation but also of the location of the centre of the saddle in different sections of the form. 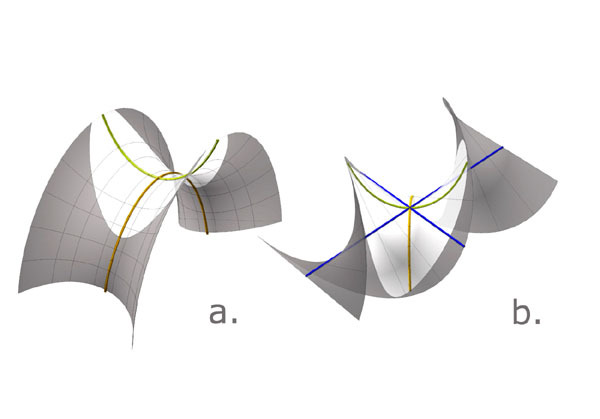 The geometrical implications of these transformations pointed towards the mathematical investigation of minimal (area) surfaces, which is a branch of topology. 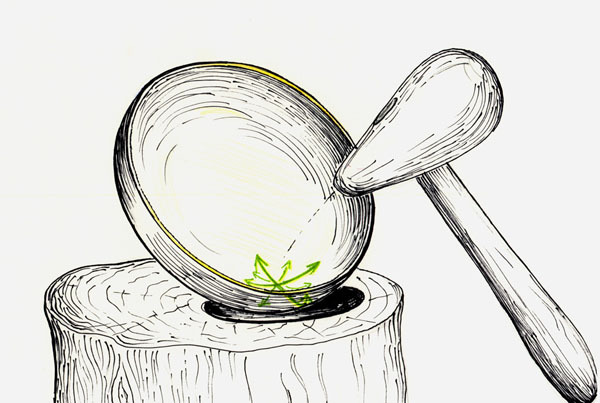 Such surfaces can be observed by dipping a non-planar wire frame into a soap solution, which naturally seeks to minimise tension and thus, its surface area. The connection to minimal surfaces is also apparent in the work of several American sculptors, Brent Collins, Robert Longhurst and Charles O. Perry, Bathsheba Grossman, and some sculptors/mathematicians make use of the principle in more explicit ways (Stewart Dickson, Carlo Sequin and Helaman Ferguson).